Works with any ECU tuning package, or even without any ECU tuning at all. With the PM4 you are not limiting your options by using a fueling solution that forces you to use only one vendor's ECU tuning suite. Reliable, easy to install and operate. Torqbyte PM4 is an advanced low-pressure fuel pump (LPFP) driver module designed as a complete Plug-n-Play replacement for the factory VAG fuel pump PWM control module in order to overcome the challenges of increased fueling in VAG returnless direct injection fuel systems where the ECU and the factory fuel pump pulse width modulator (PWM) control module perform closed loop control of the fuel system line pressure. In the factory configuration, factory fuel pump control module is only capable of supplying enough current to drive the factory in-tank low pressure fuel pump the vehicle was originally equipped with. High capacity aftermarket in-tank fuel pumps generally draw more current than the factory control module was designed to supply. Using high capacity fuel pumps often overloads the factory LPFP controller and causes it to overheat or overcurrent. This overloading and overheating results in intermittent pump operation, which causes a drop in fuel flow and line pressure as well as dangerous fuel cuts. Many ECU tuning packages attempt to work around this problem by artificially limiting the maximum pump duty in an attempt to keep the pump current just below the factory controller’s shutdown threshold. This approach leaves a significant percentage of the aftermarket pump’s capacity unused thus defeating the whole purpose behind running a high capacity aftermarket fuel pump. Torqbyte PM4 provides the best and most effective solution to this problem. PM4 installs between the ECU and the upgraded fuel sender. PM4 is capable of continuously supplying the aftermarket fuel pump with up to 36A of current. This allows it to drive all of the popular aftermarket pumps such as the Audi TTRS (VAG Part No. 8J0 919 051 E), DeatschWerks DW400, or the Walbro/TIA F90000267/F90000274 (450 LPH), Walbro/TIA F90000285 (520LPH). While the PM4 does all the heavy lifting in terms of supplying the required current to the aftermarket LPFP, its electronics interface directly with the ECU ensuring no diagnostics trouble codes are generated. Torqbyte's innovative technical solution implemented in the PM4 allows the ECU to maintain full control of the aftermarket LPFP operation and maintain the closed-loop fuel pressure control mechanism that the vehicle was originally designed with. This crucial feature is something that _none_ of the other LPFP "upgrades" currently on the market are able to offer. Since the ECU, in a vehicle equipped with a Torqbyte PM4, maintains complete control of the vehicle's fuel system operation, all the familiar pump operating characteristics are retained, such as system priming when a door is opened. As long as the selected aftermarket LPFP is able to meet the flow and pressure requirements of the user's desired fueling set-up, any fuel line pressure target requested by the ECU tune will be easily achieved. Because it interfaces directly with the ECU, PM4 is able to live-stream the ECU command duty as well as pump actual duty, over USB, to a laptop running the Torqbyte TorqVFM application. These logs can be invaluable in identifying tuning issues or diagnosing mechanical fuel system faults. PM4 can also be used when upgrading the fuel system in VAG vehicles that originally came with an OEM brushless pump. In these vehicles the brushless pump can be removed and replaced with a single or twin high capacity brushed pumps. 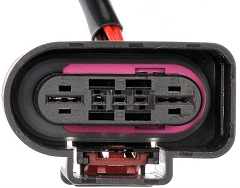 PM4 is supplied with Plug-n-Play wiring adapters that connect directly to the vehicle’s factory wiring. PM4 is housed in a rugged extruded aluminum enclosure that makes it suitable for installation under the rear seat. On the outside, Torqbyte PM4 is enclosed in a thermally-conductive, CNC machined aluminum enclosure that is hard anodized for maximum durability. On the inside, Torqbyte PM4's electronics showcase our top two design goals: Quality and Reliability. PM4's design relies entirely on industrial-grade electronic components from the world's leading semiconductor companies including Texas Instruments, Infineon Technologies, STMicroelectronics, ON Semiconductor and Vishay Intertechnology. Torqbyte PM4 kits are supplied with SAE J1127 10AWG SXL and TXL automotive wire with annealed stranded copper conductors and premium-grade abrasion, chemical and moisture resistant, high temperature Crosslinked Polyethylene insulation. All pump power adapters are supplied with the thickest possible wire gauge for the given connector family ensuring minimum line loses and maximum power transfer to the LPFP. PM4 is available in five kit options that cover most popular VAG application. Please check your factory FPCM and Fuel Pump Connector Part No.s to ensure you are ordering the correct kit. In the factory configuration the OEM fuel pump control module receives pump duty commands from the ECU and converts them to actual pump duty. The relationship between the ECU-commanded duty and the actual pump duty is called Slope and is fixed for each OEM module part number. There is no way to monitor the ECU-commanded duty or the actual pump duty forcing users to sift though VCDS logs when fueling problems need to be diagnosed. Torqbyte PM4 also receives its commands directly from the ECU, but allows the user to program in their own custom Slope values that are more or less aggressive than the nominal Slope of a vehicle's factory module. (Note: PM4 comes pre-programmed with from the factory with the optimal Slope characteristic so no programming is required prior to installation and operation). PM4 is also equipped with a USB connector that allows it to communicate with a PC running our free TorqVFM software. With the TorqVFM software, the user can test and configure the unit as well as live view or log ECU-commanded duty vs. actual pump duty. PM4 and TorqVFM can be invaluable for diagnosing difficult fueling issues such as inability of the actual LPFP pressure to reach or or stay at the commanded target level. The PM4 ships from the factory ready to install. Nothing is required to use it. However, if advanced features and functions are required, more information on the accompanying TorqVFM software can be found HERE.